Back in May, in a review of The Bookman’s Tale, I complained that the closer one is to the rare book trade, the harder it can be to enjoy fiction based on antiquarian books and manuscripts. 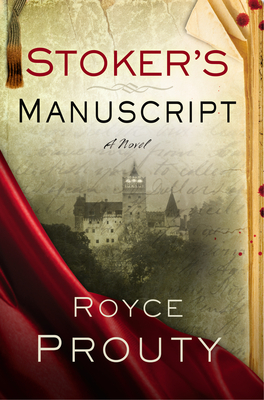 But hope springs eternal, so here I am to tell you about Royce Prouty’s debut novel, Stoker’s Manuscript, a re-telling or sequel of sorts, to Bram Stoker’s classic vampire tale. By way of plot, we open with antiquarian book and manuscript dealer Joseph Barkeley (“low volume and high margins,” he tells us), who is called to authenticate the original draft manuscript for Stoker’s Dracula. (Such a manuscript does indeed exist, having surfaced in a Pennsylvania barn in the 1980s. It is owned by Microsoft co-founder Paul Allen.) An anonymous Romanian buyer then employs Barkeley to purchase and deliver the document to the legendary Castle Bran. Once there, Barkeley realizes he is dealing with the devil. To avoid impalement, he must decode messages hidden in the text and locate the secret burial site of Dracula’s bride. Prouty’s style is more storyteller than trained novelist, so while he excels at plot and tone, his sentences could have had more finesse. His descriptions of Romanian history, geography, and lore add much to the tale. Those who have enjoyed Elizabeth Kostova’s novel, The Historian, or even, say, Matthew Pearl’s The Dante Club, will find themselves on common (unhallowed) ground -- a thriller with enough literary references to keep both the bookish and the bloodthirsty amused. Back in May, in a review of The Bookman's Tale, I complained that the closer one is to the rare book trade, the harder it can be to enjoy fiction based on antiquarian books and manuscripts. But hope springs eternal, so here I am to tell you about Royce Prouty's debut novel, Stoker's Manuscript, a re-telling or sequel of sorts, to Bram Stoker's classic vampire tale. By way of plot, we open with antiquarian book and manuscript dealer Joseph Barkeley ("low volume and high margins," he tells us), who is called to authenticate the original draft manuscript for Stoker's Dracula. (Such a manuscript does indeed exist, having surfaced in a Pennsylvania barn in the 1980s. It is owned by Microsoft co-founder Paul Allen.) An anonymous Romanian buyer then employs Barkeley to purchase and deliver the document to the legendary Castle Bran. Once there, Barkeley realizes he is dealing with the devil. To avoid impalement, he must decode messages hidden in the text and locate the secret burial site of Dracula's bride. Prouty's style is more storyteller than trained novelist, so while he excels at plot and tone, his sentences could have had more finesse. His descriptions of Romanian history, geography, and lore add much to the tale. Those who have enjoyed Elizabeth Kostova's novel, The Historian, or even, say, Matthew Pearl's The Dante Club, will find themselves on common (unhallowed) ground -- a thriller with enough literary references to keep both the bookish and the bloodthirsty amused.